Saturday 12 July. Sun blazing away, we piled into the car to get to Girona, the men stopping by beforehand at Vila Viniteca to buy their last minute wine. Umami Husband: Josh, that bottle of XYZ, it's no longer available. Josh: Guess who bought it? Hahaha. The two of them were still intent on finding that 'animal' wine FA112, and since the Barcelona Vila Viniteca as well as the Falset wineshop were out of this bottle, they thought to try their luck in Girona. Only it was not that easy to find a wineshop when we got there. I spent my time profitably buying canned tuna belly in olive oil. Only 2.50 euros a can! Then they decided to look for the tourist office so we found the city centre and parked illegally at one of the squares. I bought more stuff- ink stuffed with own squid, more tuna belly, some turrons, Marimekko the fabric stylist shop was having a good sale too- and waited for them to tell me the next step. They've given up idea of finding wine shop, and had made reservations for a one-star restaurant; the three and two stars were either closed or full. Massana Restaurant is in the middle of a very dull, nondescript area of town, but is quite successful that one can choose to eat in either the smoking restaurant or the non-smoking restaurant (not a small space, or enclosed area, but with their own entrances, cashiers etc). Inside it was cool and quiet. 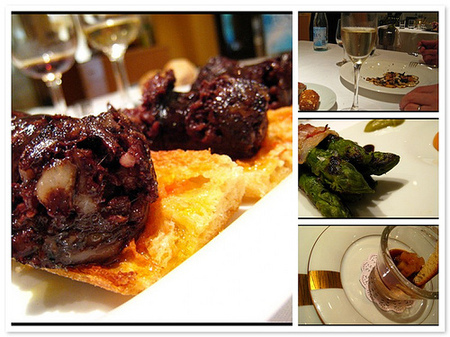 The men ordered the desgustation menu with paired wines. I ordered more sparingly, mindful of our major dinner that evening. Boy were we glad we went to this restaurant. It surpassed our expectations of a one-star, in fact I would go so far as saying that in Paris it would be more of a two or three star without the attendant price increases. I loved my first starter of grilled asparagus with romesco sauce, but I loved the next dish even more. It was stated innocuously as potato and sobrassada millefeuille with poached egg and Torta de Carnarejal- what came was like potato gratin but with runny yolks and the amazing taste of the torta de carnarejal cheese. It was richer than I expected, and I did not think I would finish my portion but I did. Which made me a little too full to enjoy my wild turbot properly. All this not helped also by an ad-hoc order of what appears to be boudin noir on toast but so much tastier, liverish and bloodyish yet without being too stinky, it was the best boudin noir I've ever had, and I've eaten not few of these in France. The Spaniards, they sure raise the culinary bar very high. We're about to find out how high, that will be in the next post, but please be patient a little longer until I can find some time to blog. It has been hectic and busy at home these days I only manage to check emails because I have the iPhone around the apartment but l'internet, we can forget about it, there's not even time to sit down and rest my old bones.